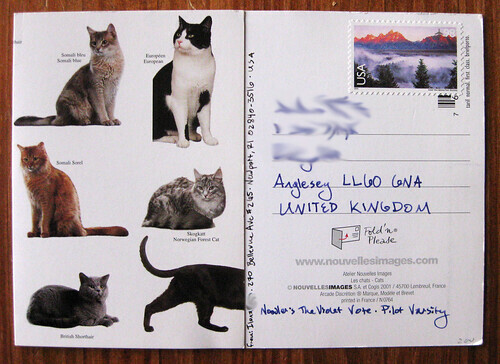 I'd been hanging on to this wonderful Nouvelles images cat foldover postcard for years, and finally felt in the mood to send it to someone. 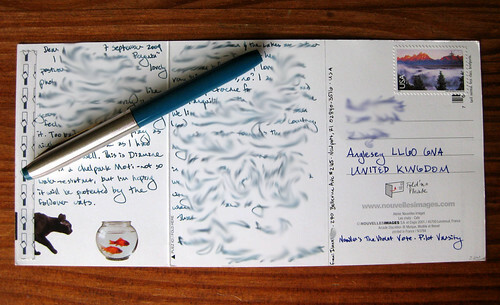 Now all neatly sealed, and looking like a postcard size (though it requires first-class letter rate postage). 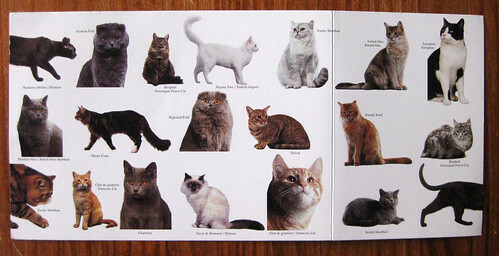 Of course it features cats. I love all the expressions on their kitty faces. 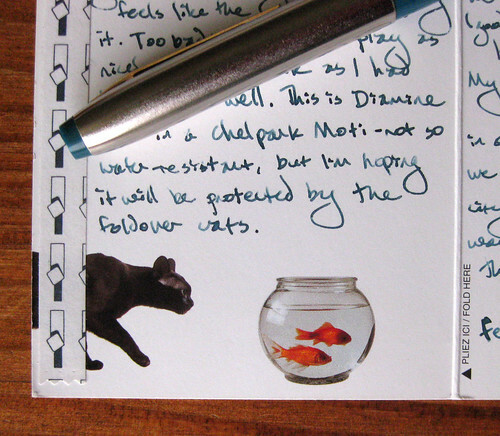 My favorite touch: the cat going after the goldfish bowl on the inside flap. that is so awesome and great . the person who gets that card is so lucky and that is just awesome . I have died and went to feline heaven! Bottom row of the main section, second from the right - that's my boy! I have converted from being a dog person to a dedicated cat person over the last few years. 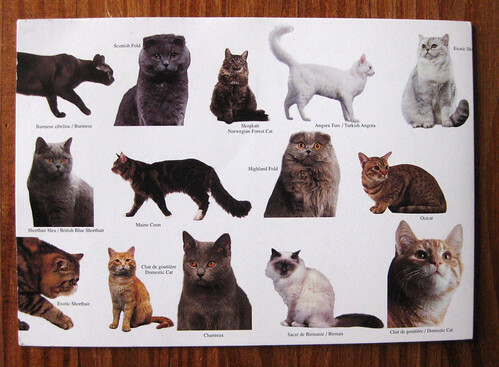 I love Nouvelles Images cards and have great difficulty in parting with them, but as a Postcrossing friend said recently, their life cycle isn't complete until they have been received by someone else. Could I put a tiny fly in your ointment? I'm sorry to be so excessively fussy, but in the UK if you want to be discrete about the address, you need to obscure the last 3 characters of the postcode. The full postcode can identify within a choice of about 4-6 residences. Sheila, thank you SO MUCH for that tip! I had no idea. I just assumed UK postcodes were like the ones in the USA, which clearly they are not. I will shoot for obscuring the postcodes for UK addresses in the future! I love the cat hunting down the goldfish at the bottom. Looks like a tiger on the prowl. Lovely piece. Have you seen my REAL wall's newspaper appearance Missive? Mischief- YES! I read your fine newspaper article this morning. It was lovely - enjoy your fame! I hope you get that stupid fine revoked.